The seas off Antarctica are teaming with wildlife, but in the cold interior only the heartiest of creatures thrive. The largest terrestrial animal on Antarctica is the flightless midge, measuring only half an inch long. Larger Antarctic creatures live in and around the sea, where it is warmer, and where a more diverse marine system means more food. Some animals like penguins and seals split their time between land and water, protected from the cold by a thick layer of blubber. The staple of the Antarctic diet of many creatures is krill, a small shrimp-like crustacean eaten by birds, fish, and whales. Listen to the amazing sounds of the animals and environment of Antarctica. 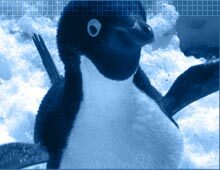 Watch videos of Adelie penguins in the wild. Take animal guided quiz to see how much you know. Robin Ross, the biologist, studies krill. Antarctic Krill is the most basic form of life in the Antarctic ecosystem, and the most integral. View images of Robin and her dive team. Learn about some of the animals that Dan has encountered on the Antarctic Peninsula. 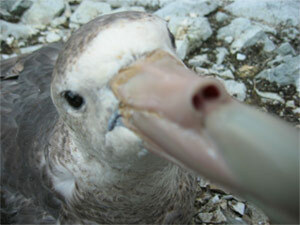 See a photogallery of an Antarctic skua killing a baby penguin.